You’ve heard you should have more than 1 (or 2 or 3) ways of making money in your business and you’re ready to add new ways of making money. Now. You want it to be easy (don’t we all) so you’re interested in options that allow you to use what you already have - and DON’T require you to create some big, completely new thing. Because seriously, who wants that? You want your business (at least parts of it) to look like passive income. Or at least more like passive income than what you have now. You want to do it all quickly (like this week quickly). If it does, you’re not alone. All of us want more money, and want it now. Problem is, most of the advice out there isn’t really helpful because it only shows you one way to do things, or it intimidates you into thinking you have to blow up your entire business and start over. I mean, seriously? Not happening. Which is why I created this comprehensive guide for you to understand why adding more ways for people to pay you is a good thing (beyond, you know, simply making more money). Plus 6 ways to do it. And a roadmap (in downloadable form even! If that’s your thing) on how to get it all done this week so money can start flowing now. You’ve probably heard the oft-repeated phrase that the average millionaire has at least 7 ways she makes money. No reason you should be any different. But why 7? What’s so magical about that number? It’s not so much the exact number that’s magical, but the smart business strategy it represents. 1. Tastes and preferences change all the time, especially online. So if you’re only offering one service there’s a decent chance it’s going to go out of vogue sooner rather than later. And if you don’t see that coming you could be in for a world of hurt while you scramble to adapt. But if you have 7 income streams and one stops works? Still not ideal, but those other 6 will tide you over while you figure out what’s next. And that’s a good thing. 2. You get to meet people at different price points and with different services. When you successfully build an online business you’re going to gain followers with lots of different financial situations. And while you don’t have to offer solutions for everyone, it’s nice to offer more than one solution. Think about it: if you only offer high-priced courses you’re cutting out everyone who can’t afford those courses. But maybe some of those people really like you, and maybe they would buy from you if you offered a more accessible product. And by offering different products at different price points, you’re also giving people the chance to test out you and your services. Because even if someone has 1k or 2k lying around to spend on a course, they may not choose to spend it if they don’t feel like they know you. By spreading out your offerings you’re allowing more people into your world. Finally, a note about the flip side: I talked a lot just now about adding a more accessible offer to your high-end services because, frankly, lots of people go for high-end first. But if you’re one of those who only has lower-priced offers, why not try a VIP offer? Some of your audience will go for it, and you only need a few people to make a huge difference in your profit. 3. Another reason you should have more than 1 revenue stream is because doing so helps you get comfortable being flexible, trying things and figuring out what does and doesn’t work for you. When people only offer 1 or 2 products they get stuck in a mindset of never offering anything that doesn’t resemble those products. And that really hinders growth. When you learn to be flexible you have the opportunity to also get creative when you need to, and that’ll pay off in spades down the line. 4. You might discover that you like something you had no idea you’d like. This one’s similar to my last reason, but different enough that it was important to include. When you never try something new, you’re never going to know whether you like it or not. It’s a universal rule that’s just as true for getting 1st graders to try exotic food as it is to your business. So give a few things a try and see what you find. Who knows, maybe you’ll find a whole new direction for your business. Buuuutttt. how many income streams do I really need? Well, I just told you that the average millionaire has 7. Personally, I have 5 and counting. I have successful friends with anywhere between 3-10. Only you will know the perfect answer for you. I can tell you this: if you only have 1, you need more. And if you’re approaching 10 or more, you might want to consider slowing down because, focus and all. Don’t get too far ahead of what you can manage on your own. When I work with clients my minimum for them is 2-3. And if they’re starting with 1 I try to get them to 4-6 by the end of our time working together (usually 6 months to a year). In the end you’ll know what’s right for you. Start experimenting and figure out what feels right! Now that I’ve convinced you how super important it is to have multiple income streams, I can’t leave you hanging without any ideas, right? Here are 6 ideas that I love because: 1) they can all be added this week (more on that below); 2) they don’t require you to create SOME BIG HUGE THING out of thin air and 3) they’re outside the realm of the usual advice you always hear, so they should spark some brand new ideas for you. Product bundles comprised of a unique combination of your courses, books, workbooks, etc that you offer at a discount compared to purchasing each item individually. Product bundles can also be joint venture offers where you bundle your product with someone else’s to offer unique value. Find a combination of related items you sell (or find someone to pair up with who has a product that complements your own) and bundle them together. 1. There’s not much work on your end because the products have already been created, you’re simply offering them in a unique package for a great price. 2. By offering a discount against the full price of each product you’re offering a unique opportunity to get a deal on your products WITHOUT becoming known for discounting your individual products or services. 3. If you choose to offer this as a JV product with another entrepreneur you’ll expand your reach by being introduced to her tribe. Action: What products/recorded webinars/information do you already have that can be organized around a central theme or need and sold in a convenient, downloadable, savable package? This might be my favorite of all the ways to monetize your business because it involves selling tools you’ve already created to help yourself run your business. Anything goes here from shopping lists, checklists and productivity systems - people are always looking to make their lives easier, so if you’ve found a way to make yours better odds are someone would be interested in hearing about it. There’s less creating here and more learning to be aware of what you’ve created for yourself that would be valuable to others. It’s easy for all of us to assume those little checklists and productivity hacks aren’t of value to anyone but ourselves, but they are. Take inventory of all the little stuff you’ve created for yourself and see what looks the most valuable. What tools have you developed to use behind the scenes with your clients or students? We usually think of software when it comes to licensing, but you can also think of it in terms of products you’ve created that may be of help to others in your field (think a system you can license to fellow coaches) or to colleagues whose clients may benefit from your work. Look around at the systems you’ve developed for your clients, or the courses or packages you sell. Which would help others in the same profession as you? Package those up and offer with limited use. What tools do you have that would be helpful to a specific population, or that you could offer publicly while still maintaining some control over the access people have or the number or type of people who have access? Makers: Do you have a unique & efficient production system that others would love to know about? Do you have a course that would fit well inside someone else’s membership site? Offer it to them on a licensed basis. Remember: You’re not licensing anything that’s a unique selling prop – just the tools you use behind the scenes. Train the Trainer programs exist to train others to do the same thing you do. If you’ve become an expert at what you do, consider training the next generation behind you. And remember this doesn’t have to mean you train them only (or even at all) on how to help their clients. It might mean you train them on everything else about the business other than the core work. For example: if you’re a designer you may not train someone else in design skill (that’s what art school is for) but you may train them on how to run a business, market themselves, etc. What have you already mastered about your business that would be super valuable and helpful to someone new to your field? If you’re a maker or service provider what knowledge can you offer outside of the actual skill? How do you offer value that a generic business coach doesn’t? The specific and strucutred 1-off offer is a speciality offer you can make to solve one specific thing for your clients. It’s best used once you’ve built up the expertise to solve one specific (and common) issue quickly and efficiently. Think about specific problems you’ve figured out how to solve for your clients quickly and efficiently. If you have a specific process you follow to solve these problems, develop a structured offer (1 hour, half a day, whatever) that you know is enough time to solve their specific problem. What problem can you solve for clients in your sleep? If you have one, you can probably replicate it for everyone. Membership sites are sites people pay (usually monthly) to access. They’re great because they allow people to start working with you at a (typically) lower price point. They’re a particularly good option for entrepreneurs who love churning out content, because membership sites do need to be kept fresh. What information do you already have on hand that can be repurposed and expanded upon to offer ongoing value? Now for the fun part! I promised I’d show you how to pull this off in week, and I will. Here’s the checklist. (Want it in printable form? Click the button below to grab a copy). What do you need to prepare for your sale? So... what are you going to create and offer this week? Tell us all about it in the comments! Email strategy has got to be one of the great mysteries of the online world. Sales funnels, welcome sequences, weekly newsletters, blogs oh my! It can make anyone's head spin, much less if you're new to the online and blogging world. Fact is talking your email strategy down to a manageable step-by-step strategy is pretty easy. And one of the first places to start is with a welcome series. But before I get into showing you exactly how to write your welcome series, let's talk about what a welcome series is. A welcome series is a series of 1-3 emails you send people in the days immediately following them signing up for your email list. The point isn't to sell anything but rather to start a relationship. After all they may have seen you in a Facebook group, come across your blog or found you on a pin and opted into a simple worksheet or checklist you offer. In other words, there's a good likelihood they've never been to your website and don't really have any idea who you are. And if they have no idea who you are there's little use of you emailing them a sales pitch or even your regular weekly newsletter, because they'll just be confused and wondering who you are. Therefore the best thing to do is to send all of your new email subscribers through a welcome series designed to introduce them to you + and your brand. How exactly to do it? I'll be honest - there are a million ways to approach a welcome series. You'll see some that last anywhere from a single email to a 2 week (or longer) series. Below is the series I've used in the past. Feel free to follow this outline or adapt to what feels more natural for you. The point isn't to follow an exact formula but rather to do what feels right for you in order to introduce people to you. yes! please send me my welcome series blueprint. As soon as someone signs up for your list you should send them whatever they've signed up for (ie worksheet, e-book, whatever your freebie offer is). Also take the opportunity to say a quick hello and let people know you'll be in touch more this week. Bonus: Ask a question that makes people want to reply to you. When people reply they'll naturally have a higher engagement with your brand, and you'll get the benefit of learning who is on your list and why. We all have overflowing email boxes so it's not at all uncommon for people to miss your initial email and opt-in, even if they're looking for it. Which means it's a good idea to follow up the next day with another link to the opt-in. This gives people 2 chances to grab what they were initially interested in. Also take the opportunity here to share your story and your why so people can get to know more about why you do what you do. Connections and understanding are important and it makes a big difference when people know why you're showing up. Day 2 brings a chance to differentiate yourself from the crowd: you've shared your opt-in with them and your story. Now share something you believe to be true (or false) about your industry that's against the norm. This will help people understand what you're all about and differentiate you from the rest of the crowd. This is also the first time you should mention anything about your programs or courses or whatever it is that you sell. Mention it in passing, but don't deliver a hard pitch yet. You want people to know you and what you offer before you go in for the sale. Now that you've differentiated yourself, share some of your best work. Send a message that includes links to your best blog posts, podcast interviews, guests posts or articles that have been written about you. This builds your authority and credibility. Time to get real: share a failure or screw up on your part and how you fixed it. We're all human and we all screw up and people want to see the human side of you. Be sincere and also make sure to show how you fixed the screw up - people want you to be real but also want to know that you can recognize and fix the mistakes that you make. Day 4 can also include a stronger call to action on how to work with you. day 5: Pure value preview content. Day 5 is a great day to share some preview content of what it's like to work with you. If you sell courses consider including a link to one lesson. If you're a coach include an exercise you use with all of your clients. You want to give people an idea of what it's like to work with you while also sharing something ridiculously valuable so that if they're not yet ready to work with you they'll still get a quick win from the information you share for free. day 6: Final, strong CTA for whatever's next including FAQ's and testimonails. Finally don't be afraid to close your welcome series with a strong call to action. Include some FAQ's and testimonials and make it clear how to work with you and why someone should. And finally, let people know what's next - set their expectation for how often they should expect to hear from you going forward. Putting a welcome series in place is one of the easiest things you can do to help people get to know you and increase the quality of your list. I hope the outline above helps take the mystery out of it so you can get one implemented this week! What questions do you have about your email welcome series? do you have one in place? does it work? tell us about it in the comments. Raise your hand high right now if you dream of more automation, easier customer nurturing systems and more passive income in your business. Good. Now that I have everyone's attention (because let's face it, I've never met anyone in the online space who didn't want at least ONE of those things, and most of you want them all) let's talk about what it takes to get there - and the biggest mistakes people make in trying to get there. And a big old disclaimer before we go any further: I believe all businesses are unique and all take different paths to where they’re going. Which means what you see below is the typical path I see my clients taking to get from where they are to where they want to be. Which is also the path I'm taking myself. But know there are a million ways to get there: some entrepreneurs will go fast, some slow. Some will skip a step when it makes sense, others will add mini-steps between these big steps. Even more of you will stop somewhere along the way because you don't want to take your particular business all the way to step 4. Those are all totally great options. What I'm sharing below is a framework to think through how to get from 1:1 services to a passive business. How you customize the framework to your individual business and desires is completely up to you. I developed this roadmap for my clients because while I heard them all saying they wanted to add more automation and passive income into their businesses, they didn't know how to to do it. And worse, they were trying to copy what they saw the most polished automated marketers doing without realizing the evolution those companies and personalities had to go through in order to systemize their businesses into the automation machines they are today. And, not surprisingly, it wasn't working for them. At all. After seeing too many of these case studies, and wanting to accelerate my own growth without falling into the same traps my clients were, and not finding anyone else who was sharing this information publicly, I decided to break down the path all the successful online marketers were taking. The end result of that process is my Client Attraction System Roadmap, your step-by-step guide to gracefully transitioning from 1:1, manual marketing, selling and delivering to systems that effortlessly attract your best clients. Keep reading to learn how to move your business through the 4 steps, and the tech and resources you need to make them happen. Most of you enter the Roadmap in Step 1: you're selling, marketing and working in a 1:1 relationship with your clients. This might mean custom graphic design, 1:1 coaching or consulting or freelancing. At this stage you're happy to have a business of your own established outside of the confines of the traditional 9-to-5, but you've also realized that the 1:1 model doesn't exactly give you the time and money freedom you've been dreaming of. And while you may have started with a 1:1 model for a bunch of reasons (typical ones being that it's the easiest and fastest way to start a business, or because automated selling felt scammy or not genuine) you've come to realize it might be something you're interested in pursuing. You've seen others do it authentically, and you've realized you don't want to continue trading your time for dollars. When you think about moving past Step 1 you have absolutely NO IDEA of how to actually make it happen, and your goal is to simply wrap your head around what an automated marketing and product delivery system might look like for you, and to start implementing baby steps to make it happen. Pay close attention to the clients you're serving 1:1 and take notes on the questions you answer over and over, the common issues they're all struggling with, and the biggest wins and a-ha's they experience while working with you. You'll come back to these notes in later steps to determine the topics you should be addressing in your automated and passive products. As you move from Step 1 to Step 2 you're realizing with certainty that 1:1 work isn't the direction you want to go long term, and that you do have all the skills and knowledge you already need to deliver results for clients in a more efficient and affordable way. At this stage you're not quite ready to deliver fully automated, passive courses but you are ready to take your 1:1 services and deliver them in a small group setting. Doing this helps you start to automate your teaching and delivery methods since you have to get everyone in the group working in the same direction at the same time, but since it's live and small group you also have the freedom to switch things up if you want to in order to get better results for your clients. Step 2 is all about starting to translate what works in your 1:1 relationships into something that can work for more than one person at a time. Pro-Tip: If you're on a fast track and learning and implementing quickly, this is the stage you're most likely to skip to move directly from Step 1 to Step 3. 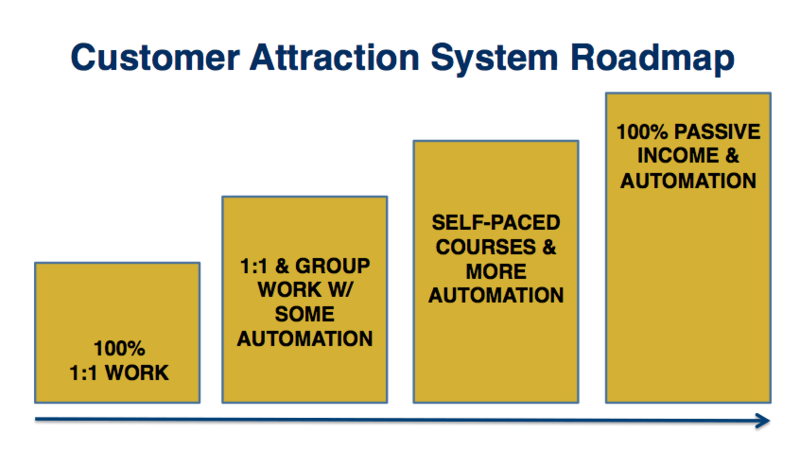 When you're in Step 2 you're focused on basic automation: welcoming prospects to your world via automated list generation and email campaigns (as opposed to having to individually connect with everyone) and systemizing what's working 1:1 to work in a group setting. Add some basic marketing automations (prime example: an email welcome series when people first subscribe to your list) to help people get to know you without having to talk to you live. Commit to list building – you actively research and create the kinds of freebies/lead magnets that will attract your right kind of customer without a bunch of manual work on your part. Use the notes about what works in your 1:1 relationships (the ones you gathered in Step 1) to create systemized ways to structure and deliver a consistent experience that can deliver the same results when consumed in a group setting as opposed to 1:1. Add in the tech you need to support list building and email auto-responders (see tech recommendations at the end of this post for ideas). Now that you've perfected the live group experience and can get your group clients the same level of results as your 1:1 clients achieve, it's time to take it a step further and translate your live group experience into a passive course delivery that doesn't require your continual live presence. You do this the same way you translated your 1:1 service to your group offer: look at what works the best for your group offer and translate it into videos, worksheets and other tools that can be shared passively. And, while you're doing that, continue to build and prime your email list so you have a group of eager customers ready to go as soon as you're ready to release your program. Step 3's all about translating your live group program a step further into a passive course, and building the audience eager and ready to jump into that course. Choose your course topic by taking the information you’ve gathered about what got the best results for your customers (both 1:1 and in your live groups). This will ensure your course topic is both relevant to your audience (because your customers found it relevant enough to implement) AND that it works (because they got results from it). Re-work that automated email welcome series you've been using to help leads get to know you into a welcome series that now serves 2 purposes: 1) helps people get to know you and what you're all about AND 2) primes them for a passive course purchase. Actually create your course content and get the tech in place to deliver it. (Not sure how? Check out my tech resources below for my recommended systems to build your course with, and for courses to check out yourself if you need help figuring out how to actually build your course). Before we dive into Step 4, full passive automation, I want to again remind you that you don't HAVE to bring your business all the way to full passive automation. Lots of entrepreneurs I know prefer to stop at Step 3 because while they want some automation built into their businesses, they also prefer to maintain some regular and live connection with clients. Totally ok. It's all up to you. Always. But if you do want to take your business fully automated, Step 4 is where you make that happen. In this final step you're focused on building on what you learned in Step 3 when you rolled out your first passive course so you can perfect your automated sales funnel that leads to that course, add additional funnels that feed into the same course, while add additional products to your portfolio. Ready to make this happen? Here's what Step 4, full automation, looks like. You've perfected that first sales funnel you created in Step 3 for your first course. It converts prospects to customers efficiently and predictably. Because you have one funnel that works you understand how to build other funnels that will work, so you begin adding either additional funnels that feed the same product (maybe with a different opt-in that attracts slightly different, yet still perfect, customers for your same original product) OR you create additional products to offer your current customers. Or maybe a combo of both. Your tech is on point and fully automated and efficient (see below for my best tech recommendations). At this point you may be thinking that the steps listed above sound all fine and good, but you have no idea how to make them happen tech-wise. I get it, I totally get it. When I first started helping clients with this and designing my own tech it was overwhelming for me too. That's why I took the time to compile this list of my favorite tech to help you make your own tech decisions. It'll also help you move (alot) faster than I was able to when I had to start from scratch to figure it all out. Of all the tech systems you need to build your business I easily spend the most time advising clients on which email system to choose. The two I recommend when you're just starting out - and that will easily scale with you - are Active Campaign and ConvertKit. Both are budget friendly when starting out (they start at $9/month and $29/month respectively) and they'll deliver robust automation tools at that price that people are used to paying hundreds of dollars a month for. Seriously these 2 programs are relatively new to the online entrepreneur space and they are game changers when it comes to the functionality they deliver at their price points. I know it's tempting to start with MailChimp's free account, but it won't scale with you AT ALL and I highly recommend against starting here. You'll end up having to move systems within a month or 2 and that's never fun. Might as well build it right from the beginning. As for me I currently use Active Campaign but have begun recommending that my 1:1 clients move to ConvertKit, and I'll likely be making the same move in the not-too-distant future. When it comes to email I hear about the classic systems all the time: MailChimp and AWeber at the beginner end and Ontraport and InfusionSoft at the advanced level. I don't recommend any of these: MailChimp and AWeber haven't stayed up-to-date with functionality to deliver the kind of automation Active Campaign and ConvertKit offer at the low end of the pricing scale, and Ontraport and InfusionSoft also can't compete with Active Campaign and ConvertKit when it comes to growing and scaling. I'm a huge fan of AC and CK and there's absolutely no reason to consider any other program. If you want to create passive products you need a robust email list. And in order to build that list efficiently you're going to need a lead capture system that works. I personally use - and HIGHLY recommend LeadPages as your lead capture system. If you have to use something else (and seriously, please don't, LeadPages just works and works well) you can consider the other options listed below. You're going to want a robust opt-in and pop-up system to complement your lead capture software for the most efficient list building. Again I highly recommend using LeadBoxes (which come with your LeadPages subscription) for this. I personally use LeadBoxes and SumoMe (the free version) for my opt-ins and pop-ups. You'll need a way to accept payment for your products. I recommend you offer both PayPal and credit card options for this, because research shows consumers of online products are split down the middle between preferring to pay via PayPal or credit card. And more importantly, they're not very flexible when it comes to their preference. Which means if they prefer PayPal and you don't offer it they're actually unlikely to get a credit card out and you'll lose the sale. And vice versa. Offer both and you won't miss out on business. Both are free to use and have similar per-transaction fees. I didn't get into it much in this post (because it's a big topic that's a post - or course - in itself), but webinars are a fantastic way of growing your list and doing so fast. I love webinars and personally use WebinarJam for all of my webinars because it's easy to use and offers robust and easy-to-use features for recording, scheduling and registering your participants. Others simply use Google Hangouts which is a free and perfectly acceptable place to start, especially if you have a LeadPages account that you can integrate it with. WebinarAlly from the lovely Nathalie Lussier is a very affordable system to start with if you're a WordPress user. If you want to deliver passive courses you'll need a software platform to do so from. I'm a huge fan of Teachable - it's quick to set up and offers the best user experience out there - but it can also be expensive, so if you want something a little friendlier on the budget I recommend Wishlist Member or Zippy Courses to start. This one's not tech, but I get a ton of questions on how to actually structure and build the course content of your course. For that I recommend David Siteman Garland's Create Awesome Online Courses course. Full disclosure I haven't taken this course myself (I didn't take any courses that specifically covered course building) but have several clients who have and rave about it - and have fantastic results from it - so I feel very comfortable recommending it. When you're creating your course you're probably going to find yourself becoming an amateur video editor. These programs will make that as easy as possible on you. If you're not using Teachable you'll also need a place to host the course videos your students will view through your course platform. Wistia and Vimeo Pro will both get the job done easily. Before I leave you to it I want to offer a final pep talk when it comes to actually implementing your tech: Don’t overthink this. I work with so many entrepreneurs who spend MONTHS researching the best option for all of these needs. And in turn they never end up releasing anything or making any progress on their desire to become more automated. The absolute best choice you can make when it comes to choosing a solution in any of these categories is to make a choice. Every choice you make is changeable down the line if absolutely necessary so don't paralyze your progress and your business by spending too much time on this. Check out my recommendations, make a choice and move on to implementing it. The other worst mistake I see entrepreneurs make is always choosing the free or lowest cost option. Listen: you are running a business. I'm not saying the free choice isn't always the best choice (there are plenty of free choices listed in my recommendations above) but free is not always best. If it's not going to deliver your objectives (like MailChimp's free account) don't use it. Put the tech in place that you need to deliver your business. If you don't you won't grow. Bottom line. One final note: a few of the links above are affiliate links. That means I get a small commission if you use my link to purchase the software (at no extra cost to you). Consider it a small thank you for pointing you in the right direction. Or, if you're not comfortable with it, simply type the name of the software into your google toolbar and navigate there on your own. And now it's your turn. What step do you want to take your business to? What's the next step you're going to take to start making that happen? Tell us about it in the comments!